It’s been one of the UK’s top three best selling cars in each of the last 14 years and only the Ford Fiesta outsold it in 2013. Now, the Ford Focus is set to get even better when new styling, technology and engines arrive for car lease and contract hire customers this June. Unveiled at this week’s Geneva Motor Show, the 2014 Ford Focus boasts a range of new technology, a great choice of power trains and the company’s signature design. Keep reading to find out why the new Focus is set to take the car leasing market by storm this summer. The Ford Focus has appeared in the UK’s top three selling car list every year since 1999. Now, a brand new design, an improved interior and some economic engines are set to make the family hatchback even more popular. The car will boast Ford’s SYNC 2 voice control system which links the navigation system, climate control and audio systems as well as linking to your mobile phone. It will give you directions based on you speaking a house number and street and adjust the climate control or play an audio track if you tell it to. It will also read out text messages and, if you activate the voice control and say ‘I’m hungry’, it will even show you a list of local restaurants. As well as this market leading system the Focus also boasts a range of other technologies. Global vehicle line director Sherif Marakby explained that while the new Focus is more technologically advanced than its predecessor, the challenge was to make it easy to use. Ford of Europe’s product development chief Joe Bakaj said that when the previous generation Focus was introduced in 2010 it was the most advanced car in its segment. “What we needed to do was make the best even better this time around,” he added. 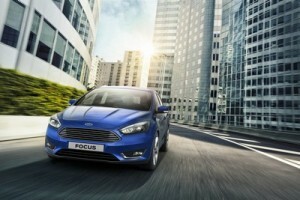 The new Focus is also the first Ford to be sold in Europe with the new 1.5-litre four-cylinder petrol EcoBoost. It comes in 148bhp and 178bhp versions, and will be available alongside the existing 99bhp and 123bhp 1.0-litre three-cylinder EcoBoosts. Diesel choices include the 1.5-litre TDCi in 94bhp and 118bhp guise, a 94bhp and 113bhp 1.6-litre TDCi and a 148bhp 2.0-litre TDCi. Ford claims the diesel units are eight per cent more efficient than before, while the petrol engines are an average of 5.5 per cent cleaner. As well as new engines and new technology the 2014 Focus also boasts a striking new design. The new model adopts elements of the One Ford global design introduced on the Mondeo and Fiesta, most notably the inverted trapezoidal grille at the front of the car. Prices are expected to remain similar to their current level which means the new Focus is likely to be popular with contract hire and car leasing drivers. It hits UK showrooms in June. This entry was posted in Car Updates & Releases, Cars, Family Car, Manufacturer News, New Cars and tagged 1.5-litre EcoBoost, ecoboost engine, ford, ford focus, lease a new ford, new ford focus by David Petherick. Bookmark the permalink.